Hosting Thanksgiving dinner can be an overwhelming task, especially if you’re welcoming dozens of distant family members into your home. Rather than feeling frazzled and missing out on the holiday festivities, you can find a way to host dinner while enjoying time with your family. Whether you are hosting your first Thanksgiving dinner or your tenth, a few simple strategies can turn that hectic day into a memorable one. Tackle simple tasks in the week leading up to Thanksgiving. Don’t leave everything to Thanksgiving morning because you will surely be overwhelmed. For example, you can set the dining room table days in advance. Have your family help pick up around the house. Finish your grocery shopping early in the week so that you aren’t battling crowds on the day before Thanksgiving. Many desserts hold up well in the freezer, so you can make them ahead of time, freeze them, and bake them on Thanksgiving morning. You can even start preparing for your Thanksgiving right now. Consider making decorations or purchase some and decorate your house this week. The earlier, the better. You might be hosting Thanksgiving at your dinner table, but that doesn’t mean you have to provide all of the food. Ask your guests to contribute to the meal. You can provide the turkey and a few of your favorite sides or desserts, but have the guests fill in the rest. Dole out tasks to guests to help alleviate some of the work on your end. Having some help will result in less time spent in the kitchen and more time spent mingling with guests. Hosting a potluck dinner is a sort of trend these days. Even a well-planned Thanksgiving dinner can turn into a disaster if the turkey takes an extra two hours to cook or you burn everything in the oven. Create a schedule to help you get through the cooking and baking frenzy that is Thanksgiving. Write out what time you need to make everything. Leave yourself enough time to shower and get dressed— you don’t want to leave these basic tasks for the last minute. Be prepared for a glitch or two, and be willing to adjust your schedule accordingly to account for any holiday hiccups. Thanksgiving should be a time for you to gather with your family without feeling pressure to impress. Don’t make your Thanksgiving dinner a formal affair if you’re going to have kids running around. A casual Thanksgiving dinner with the family huddled around the television watching football and enjoying each other’s company can be just as enjoyable as a formal event. Use the Thanksgiving holiday to spend time with your family, not impress them with an overdone event. Appetizers are a great way to distract your guests from the dinner itself. You don’t know what can happen in the very last moment. But you will know that your guests aren’t hungry and they have something to eat while you are fixing your cooking disasters. Appetizers will also help to keep your guests socializing while you are getting your dinner on the table. 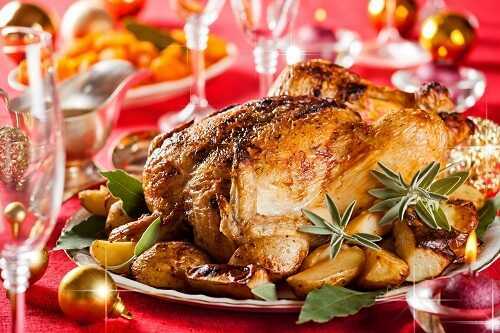 The holiday season, including Thanksgiving Day, isn’t about cooking and pleasing the crowd. It’s about enjoying the time together feeling great and happy. However, when you’re busy with preparations and think you have no time to relax, chances are you won’t enjoy your dinner. Even if you will, you’ll wake up the next day forgetting many moments. Dedicate the last 30 minutes to yourself. Meditate, pray, do some relaxing yoga poses, or whatever helps you calm down and focus on having fun. If you’re hosting the big feast this Thanksgiving, don’t do it all alone. Just like your guests, you deserve to look and feel relaxed and enjoy the whole holiday. Start early so that you could do everything without a hustle. How do you keep your sanity when preparing Thanksgiving dinner? Do you think a potluck dinner is a budget- and nerve-friendly idea? Share your thoughts with us.